Here are the rules for my dialect of OD&D, restated in Dungeon World* style moves. I would like a more formalized system for defending, but so far all I have is that shield bearers grant a +1 AC bonus to their employer (I don’t think this particular house rule has stuck though). Some D&D referees use intelligence checks as a sort of spout lore move, but I tend to be more descriptive. Players tell me what they examine, and I provide details as appropriate. Outstanding warrants seems like a good way to ensure that actions have consequences, and I’m going to think more about how that might apply to D&D. Bolster allow PCs to get bonuses to certain kinds of actions by preparing during downtime. Not bad, but doesn’t seem necessary. Encumbrance is an awkward fit for a move, but it does have system weight in both DW and OD&D, so it seems reasonable to include it in the list. The equivalent of the end of session move in my OD&D game really encompasses all of the downtime actions between sessions, including level up and carouse. Now, I’m not claiming that “moves” are just a different way to talk about things that we already do. They actually do function differently. For one thing, Apocalypse World uses a single resolution system when it comes to dice (roll+STAT) while OD&D uses a plethora of resolution systems. But there is some correspondence between the two models, and probably far more than is often acknowledged by the two schools of play. The game concept of moves in Apocalypse World is commonly misunderstood by old schoolers. Moves are not equivalent to actions or powers. They are not a menu of things to do. Instead, they represent when the rules kick in to resolve uncertainty “in the fiction” (to use the terminology popularized by AW). * Apocalypse World (AW) and Dungeon World (DW) are used somewhat interchangeably. This entry was posted in Uncategorized and tagged Dungeon World on February 16, 2013 by Necropraxis. but but, I don’t want to memorize cute names for everything. Interesting, I hadn’t thought of equating read magic and spout lore. I don’t think they quite fit structurally, because read magic generally requires the referee to place an obvious marker within a location that invites the usage of read magic whereas spout lore can be invoked by a player in any situation and then requires improv, ruling, or allowing the player to make something up (sharing narrative control). Defend rules vary by edition, but I’ve never been entirely satisfied with them. LotFP has a pretty good one, whereby fighters (or is it anyone?) can choose between offensive, defensive, and standard dispositions (which are to attack/AC respectively: +2/-4, -4/+2, +0/+0, if I recall correctly). I don’t think any of them require you to give up your action, which is nice. The interesting and clever part of the Apocalypse World approach is that players do not need to know much about the moves. You just lead with the fiction and then the GM will let you know when it sounds like a move and when to invoke the dice. 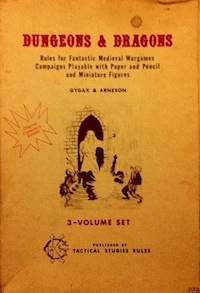 Obviously this is not an absolute; most players will probably know something about the moves, and try to drive the fiction toward invoking them, but that is not strictly speaking required (just like you can play D&D without fully understanding the attack roll; AW is just more explicit about prioritizing the fiction over the rules). I agree some of the Dungeon World moves have awkward and/or overly cute names (hack and slash, bend bars/lift gates: I’m looking at you). The Apocalypse World move names tend to be better, I think, as long as you enjoy the overall aesthetic. Hackmaster has an excellent defense move. Full defense: You increase your AC by 1 + 1/2 your level. Fighters increase their AC by 1 + their level. In my experience, DW is problematic (at least to me and to the group I play with) because it uses the same tropes D&D uses and it explicitly tries to mimic it to the extent it is possible. It tells the reader (inexplicitly) you can play it like any other fantasy games because the same ingredients are used. But you can’t. DW is a different animal, the underlying system is fundamentally different. I would say it is somewhere between games type A (where an action will always have the same consequences and the rules are in direct connection to certain elements in the fiction they represent; e.g. D&D) and type B (where it is not always so; e.g. Don’t Rest Your Head or My Life With Master). Anyway, I must admit I don’t quite get the point of your post. Let me paraphrase one of my comments from the G+ conversation about this. I was interested in highlighting some of the commonalities I saw between DW and old school D&D (there are differences too, but that is a different topic). I learned much of this stuff from old school sources, and then I saw it again in DW using different language, and I think this is interesting. It can inform old school play (at least, it did for me). I think it is worth looking at if you consider yourself an OSR, DIY, whatever, gamer rather dismissing it as a story game.﻿ There are some ideas that can be used (that I have used) with old school play. I have a few more posts in the works as well about DW. I haven’t played either Don’t Rest Your Head or My Life With Master so I’m not sure how it compares to them. I mean, consider something like outstanding warrants… doesn’t that seem like a cool way to make sure that actions have consequences?